Alupent ® (metaproterenol sulfate USP) Inhalation Aerosol is a bronchodilator administered by oral inhalation. The Alupent Inhalation Aerosol containing 75 mg of metaproterenol sulfate as micronized powder is sufficient medication for 100 inhalations. The Alupent Inhalation Aerosol containing 150 mg of metaproterenol sulfate as micronized powder is sufficient medication for 200 inhalations. Each metered dose delivers through the mouthpiece 0.65 mg of metaproterenol sulfate (each ml contains 15 mg). The inert ingredients are dichlorodifluoromethane, dichlorotetrafluoroethane and trichloromonofluoromethane as propellants, and sorbitan trioleate. In vitro studies and in vivo pharmacologic studies have demonstrated that Alupent ® (metaproterenol sulfate USP) has a preferential effect on beta-2 adrenergic receptors compared with isoproterenol. While it is recognized that beta-2 adrenergic receptors are the predominant receptors in bronchial smooth muscle, recent data indicate that there is a population of beta-2 receptors in the human heart existing in a concentration between 10-50%. The precise function of these, however, is not yet established (see WARNINGS section). The pharmacologic effects of beta adrenergic agonist drugs, including Alupent, are at least in part attributable to stimulation through beta adrenergic receptors of intracellular adenyl cyclase, the enzyme which catalyzes the conversion of adenosine triphosphate (ATP) to cyclic-3',5'-adenosine monophosphate (c-AMP). Increased c-AMP levels are associated with relaxation of bronchial smooth muscle and inhibition of release of mediators of immediate hypersensitivity from cells, especially from mast cells. Pharmacokinetics Absorption, biotransformation and excretion studies in humans following administration by inhalation have shown that approximately 3 percent of the actuated dose is absorbed intact through the lungs. The major metabolite, metaproterenol-3-0-sulfate, is produced in the gastrointestinal tract. Alupent is not metabolized by catechol-0-methyltransferase nor have glucuronide conjugates been isolated to date. Pulmonary function tests performed concomitantly usually show improvement following aerosol Alupent administration, e.g. an increase in the one-second forced expiratory volume (FEV 1 ), maximum expiratory flow rate, forced vital capacity, and/or a decrease in airway resistance. The resultant decrease in airway obstruction may relieve the dyspnea associated with bronchospasm. Controlled single- and multiple-dose studies have been performed with pulmonary function monitoring. The duration of effect of a single dose of two to three inhalations of Alupent (that is, the period of time during which there is a 20 percent or greater increase in FEV 1 ) has varied from 1 to 5 hours. In repetitive-dosing studies (up to q.i.d.) the duration of effect for a similar dose of Alupent has ranged from about 1 to 2.5 hours. Present studies are inadequate to explain the divergence in duration of the FEV 1 effect between single- and repetitive-dosing studies, respectively. Alupent ® (metaproterenol sulfate USP) is indicated as a bronchodilator for bronchial asthma and for reversible bronchospasm which may occur in association with bronchitis and emphysema. Although rare, immediate hypersensitivity reactions can occur. Therefore, Alupent ® (metaproterenol sulfate USP) Inhalation Aerosol is contraindicated in patients with a history of hypersensitivity to any of its components. 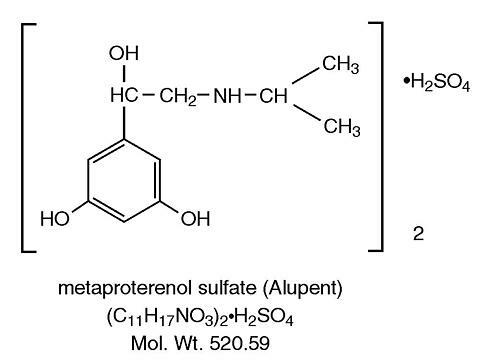 Fatalities have been reported following excessive use of Alupent ® (metaproterenol sulfate USP) as with other sympathomimetic inhalation preparations, and the exact cause is unknown. Cardiac arrest was noted in several cases. Alupent, like other beta adrenergic agonists, can produce a significant cardiovascular effect in some patients, as measured by pulse rate, blood pressure, symptoms, and/or ECG changes. As with other beta adrenergic aerosols, Alupent can produce paradoxical bronchospasm (which can be life threatening). If it occurs, the preparation should be discontinued immediately and alternative therapy instituted. Alupent should not be used more often than prescribed. Patients should be advised to contact their physician in the event that they do not respond to their usual dose of a sympathomimetic amine aerosol. General Extreme care must be exercised with respect to the administration of additional sympathomimetic agents. Information for Patients Appropriate care should be exercised when considering the administration of additional sympathomimetic agents. A sufficient interval of time should elapse prior to administration of another sympathomimetic agent. Drug Interactions Other beta adrenergic aerosol bronchodilators should not be used concomitantly with Alupent ® (metaproterenol sulfate USP) because they may have additive effects. Beta adrenergic agonists should be administered with caution to patients being treated with monoamine oxidase inhibitors or tricyclic antidepressants, since the action of beta adrenergic agonists on the vascular system may be potentiated. Carcinogenesis/Mutagenesis/Impairment of Fertility In an 18-month study in mice, Alupent produced an increase in benign ovarian tumors in females at doses corresponding to 320 and 640 times the maximum recommended dose (based on a 50 kg individual). In a two-year study in rats, a non-significant incidence of benign leiomyomata of the mesovarium was noted at 640 times the maximum recommended dose. The relevance of these findings to man is not known. Mutagenic studies with Alupent have not been conducted. Reproduction studies in rats revealed no evidence of impaired fertility. Pregnancy/Teratogenic Effects PREGNANCY CATEGORY C: Alupent has been shown to be teratogenic and embryotoxic in rabbits when given in doses corresponding to 640 times the maximum recommended dose. These effects included skeletal abnormalities, hydrocephalus and skull bone separation. Results of other studies in rabbits, rats or mice have not revealed any teratogenic, embryocidal or fetotoxic effects. There are no adequate and well-controlled studies in pregnant women. Alupent should be used during pregnancy only if the potential benefit justifies the potential risk to the fetus. Nursing Mothers It is not known whether Alupent is excreted in human milk; therefore, Alupent should be used during nursing only if the potential benefit justifies the possible risk to the newborn. Pediatric Use Safety and effectiveness in the pediatric population below the age of 12 have not been established. Studies are currently under way in this age group. Adverse reactions are similar to those noted with other sympathomimetic agents. The most frequent adverse reaction to Alupent ® (metaproterenol sulfate USP) administered by metered-dose inhaler among 251 patients in 90-day controlled clinical trials was nervousness. This was reported in 6.8% of patients. Less frequent adverse experiences, occurring in 1-4% of patients were headache, dizziness, palpitations, gastrointestinal distress, tremor, throat irritation, nausea, vomiting, cough and asthma exacerbation. Tachycardia occurred in less than 1% of patients. Alupent ® (metaproterenol sulfate USP) Inhalation Aerosol is not recommended for children under 12 years of age. It is recommended that the physician titrate dosage according to each individual patient's response to therapy. Each 100 inhalations of Alupent ® (metaproterenol sulfate USP) Inhalation Aerosol contains 75 mg of metaproterenol sulfate as a micronized powder in inert propellants. Each metered dose delivers through the mouthpiece 0.65 mg metaproterenol sulfate (each ml contains 15 mg). Alupent Inhalation Aerosol with Mouthpiece (NDC 0597-0070-08), net contents 7g (5 ml). The mouthpiece is white with a clear, colorless sleeve and a blue protective cap. Each 200 inhalations of Alupent Inhalation Aerosol contains 150 mg of metaproterenol sulfate as a micronized powder in inert propellants. Each metered dose delivers through the mouthpiece 0.65 mg metaproterenol sulfate (each ml contains 15 mg). Alupent Inhalation Aerosol with Mouthpiece (NDC 0597-0070-17), net contents 14g (10 ml). The mouthpiece is white with a clear, colorless sleeve and a blue protective cap. Alupent Inhalation Aerosol Refill (NDC 0597-0070-18), net contents 14g (10 ml).